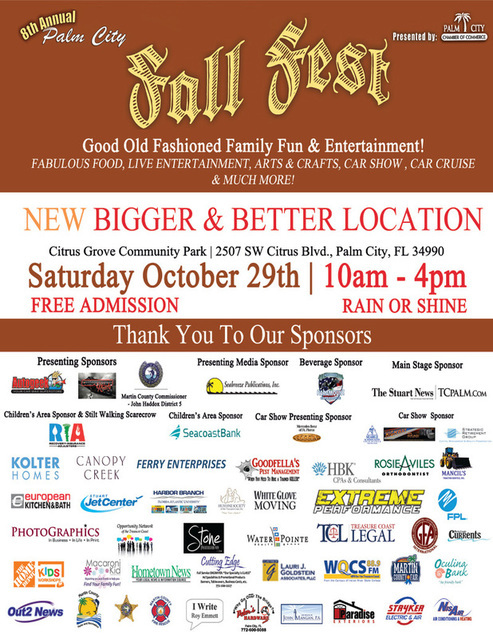 The Palm City Chamber’s 8th Annual Fall Fest will be held on Saturday, October 29th at Citrus Grove Park located at 2507 SW Citrus Grove Blvd. in Palm City from 10:00AM to 4:00PM. Children and adults alike will have a wonderful fun-filled day at Fall Fest. Enjoy a fall day of activities, art & craft booths, car show, music & entertainment while the children are busy with several hands-on activities and games, plus the awesome pumpkin patch.